Yesterday a reader sent me a screenshot in MLB 13 The Show of Nick Markakis, the Baltimore outfielder, taking his position at shortstop after pinch-hitting for J.J. Hardy. To a casual fan, it sort of sits there, waiting for you to guess what's wrong. Here's a hint: In real life, Markakis throws lefthanded. No lefthander has actually taken the field at shortstop in a major league game in at least a century, and possibly a lot longer. In fact, in Major League Baseball four of the six infield positions are almost exclusively the domain of righthanders. And the last time a southpaw took the field at second base was in the aftermath of one of baseball's most infamous games, which celebrates its 30th anniversary today. Because of the rarity of lefthanders at shortstop, second base, third base or catcher, there appear to be no throwing or fielding animations for them in MLB 13 The Show. In fact that is the case: "Because lefties don’t normally play in the infield (other than first base), this has never really been a priority for us," Sony's San Diego Studio, the makers of the game, told Kotaku. "There's definitely a possibility that we could work this into the game, but it's just a matter of how much time we invest in something that never usually happens in real life. Every hour we spend on this, takes away from something else that's probably more important." That's why MLB the Show forced Markakis to play as a righthander at shortstop, as reader Matt D. noticed after the computer straight-up pinch hit Markakis for Hardy in the eighth inning of an ordinary Franchise league game. "When they first announced [Markakis] was going to shortstop, I was hoping he was left handed and that I would hit a grounder there," Matt said. "No luck." Why does this matter? Animate the throw in your mind. The batter smashes one deep into the hole between third base and short. A righthanded shortstop makes a backhand diving grab (glove's on his left hand), and springs to his feet, shoulders already pointing to first base like his little league coach taught him, arm cocked for the throw. Now a lefthander. He catches the ball forehanded, gets up, and ... his shoulders are pointing at the third-base grandstand. His plant foot is used to arrest his momentum or get him standing, and will need another step to make the throw. This requires an extreme, time-consuming motion to set one's self for a long throw down to first. Most of these plays become an infield hit. Ah, but what about a right-handed shortstop going to his left? This matters less because his momentum is still carrying him toward first base, allowing him an easier throw on the run, to boot. It's the same case at second base and third base (whose distinctive responsibility is still to stab a hot smash going up the line and gun the runner at first). But shortstop, by virtue of the fact most batters are right handed and will pull grounders to that side of the field, the physical disadvantage is at its most palpable. As for first base, throwing hand makes no difference. A first baseman's job is simply to catch the damn ball and hit .300/30/100. If Nick Markakis actually did play shortstop in real life, he'd be the first lefthander to do so in at least a century. This isn't some bias against southpaws or the accepted wisdom of baseball men who still think the sacrifice bunt is a great idea. It's the orientation of the field and the location of the base where most putouts are recorded. If batters ran clockwise and third became first, there'd be no righthanders in the middle infield either. You can comb the boxscores and find only a handful of lefties at these positions. Since 1916, five lefthanders are listed as playing shortstop in a game, but in truth, they never took the field. (1916 is as far back as the searchable data goes on Baseball-Reference.com). All but two of these appearances are a kind of first-inning pinch-hit situation, in which the visiting team put a lefthanded batter at shortstop in one of the first three lineup positions to have him face a righthanded pitcher. Once he reached base, or before the team took the field, he was immediately replaced by the regular shortstop, though still getting credit for a start at that position. Baltimore manager Earl Weaver did it seven times, six of them in September 1975 as the Orioles struggled to catch first-place Boston. Incidentally, Lou Gehrig preserved his streak of 2,130 consecutive games played by "starting" at shortstop and batting leadoff at Detroit on July 14, 1934. After getting a base hit, he was immediately replaced. Press accounts at the time said Gehrig had suffered severe back pain in the preceding game and had to be helped from the field. At any rate, it seems safe to say no lefthander has taken the field at shortstop in at least the past 100 years. A southpaw at second base is equally rare, and Billy Martin, the fiendish manager of the New York Yankees and Oakland A's, is responsible for the last three times a lefthander has been put in the lineup at second base. The most recent instance came on Aug. 18, 1983, in the resumption of the Pine Tar Game, which turns 30 today. Martin put none other than Don Mattingly at second as a middle finger to the American League president Lee MacPhail, who overruled the disqualification of George Brett's tar-slathered bat and ordered the game resumed on an off-day three weeks later. In 1974, while managing Oakland, Martin used Gonzalo Marquez twice as a first-inning pinch hitter, perhaps inspiring Weaver to try the same thing a year later. The last lefthander to get any fielding chance at second base in fact tagged a man out at first. On June 14, 1958, Cincinnati manager Birdie Tebbetts swapped slow-footed first baseman George Crowe and regular second baseman Johnny Temple to defend a sacrifice bunt situation. Temple charged the bunt, caught the pop-up, and threw back to Crowe covering first; the two players then went back to their old positions. Why this needed an official position change in the boxscore as opposed to just being an unorthodox shift, I don't know. Coincidentally, Mattingly is also the last lefthander to start a game and field a chance at third base, where just six have been listed at the position since 1916—again many of them simply as pinch-hitters. The Chicago White Sox' Mario Valdez pinch hit for Chris Snopek in 1997 and remained in the game at third, but didn't have any fielding plays. But on Aug. 31, 1986, Mattingly started at third and, remarkably, threw out four runners at first base. Lefthanded catchers are rare for a few reasons: the majority of batters are righthanded, and even if they get out of the way, they would still alter or delay a straight throw to catch a baserunner trying to steal, more than they do for a right-handed thrower. A common sacrifice to the first base side of the field is also more difficult to field and throw to first. Plus that awesome ring-em-up throw down to third after a strikeout with nobody on just looks janky as all hell with a hip pivot. So how do the video games handle this? 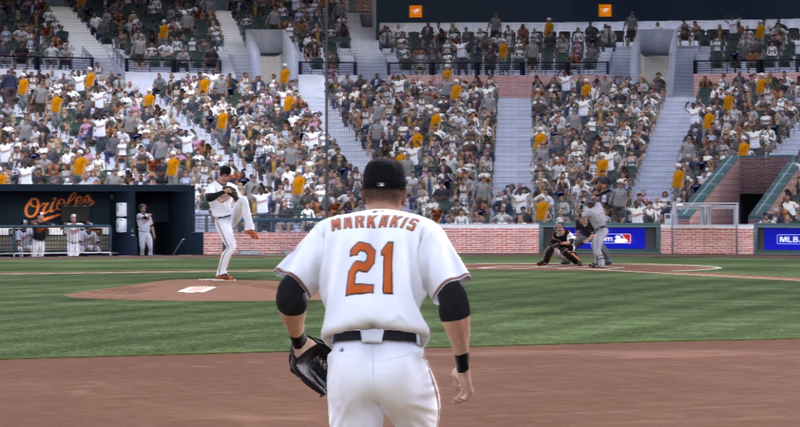 As the image above shows, Markakis is forced to throw righthanded in MLB 13 The Show. So is any lefthander taking second base, third base, or playing catcher. When you create a player, whether in the main roster or in Road to the Show, your throwing hand option is grayed out if you want to play middle infield, the hot corner or catcher. You want to see lefthanded infielders? Pop in MLB 2K13 and substitute one to that position. I am not kidding. I've dumped all over this game, but if you want to see what an historical rarity looks like, only that game will provide it. I swapped Gregor Blanco of the San Francisco Giants to the backstop just to see what would happen, and almost as if the game sensed it, Shin-Soo Choo bunted on the first pitch. (Blanco fielded it and throwing on the run, still got Choo out at first). I'm not sure there's any position in any other team sport that is so hamstrung by the game's fundamentals as to make a certain type of handedness ineligible to play it, even as a created player in a video game. The biggest change you'll see is in, say, Madden, where a lefthanded quarterback needs a strong right tackle to protect his blindside, instead of vice versa. But I haven't seen any hard-code limitations placed on that position in Madden, nor on power forwards in NBA 2K, midfielders in FIFA, or wingers in NHL. You can call it a quirk, a shortcoming, or even a tradition, but if MLB The Show isn't mirroring the throwing motion, at least it's still mirroring real life.